Xclaim™ features super stretch push-fit fabric graphics that come pre-attached to the collapsible frame to create sleek, polished displays. 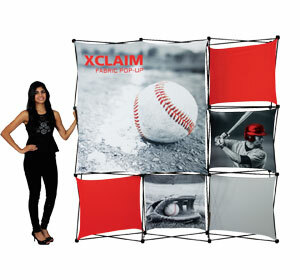 Quickly command attention at your tradeshow with the eye-catching Xclaim™ display system. Graphics are replaceable for future shows, printed in high resolution on durable, fade-resistant stretch-fabric material.